I've heard it said that it's a problem that the film has no moral compass. Oh ... it has a moral compass, just like "Goodfellas" does. I find it curious that anybody could watch this film and not see that it's condemning these people's lack of any values ... it's just not SAYING this outright because that's a terrible way to tell a story. It makes me suspect that people don't notice it because they are too much like these characters and think all this empty excess is okay. Dark, blunt, delusional, hysterical. The movie sometimes takes the viewer to the frenzied and intoxicated minds of the characters, only to crash at a cold and morbid reality a little later. It competently steers the viewer through its wildly different states of mind, leaving us numb at the end, making for a worthwhile experience. REWATCH: 83 -> 88. 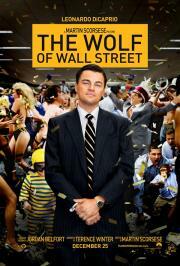 The energy and craftmanship Scorsese put into Wolf of Wall Street is utterly admirable and tremendously entertaining. Wow. Dude. DiCaprio slayed this role. Love it.